History Channel special documentary “Vida Eterna” (Eternal Life) premiered on May 4, 2013 across Latin America. Main interviewee and adviser was Jose Luis Cordeiro, Director of the Venezuela Node of The Millennium Project. “Vida Eterna” (available in Spanish and Portuguese) considers the long quest for immortality among humans throughout history and the latest scientific advances that could make it possible in the next few decades. Is there a fountain of eternal youth? Will there ever be one? Can we have a world without physical death? What technologies will keep extending our lives in a healthy way? Will we really see the “death of death?” What are the social, philosophical and religious implications? "The search for the secret to eternal life seems to come to an end: Researchers claim to have the formula for immortality" reads the introduction to this original documentary produced by History Channel. Several doctors, historians, futurists, scientists, philosophers and religious leaders were interviewed all over Latin America and the USA. Venezuelan futurist Jose Luis Cordeiro was the main technical adviser and interviewee. He was accompanied by Colombian scientist Hernando Ramirez Llinas and Argentinean producer Laura Eliosoff during the media tour in Mexico to launch the “premiere” on Saturday May 4, 2013, all over Latin America. The documentary lasts for two hours and considers the philosophical and religious implications of physical immortality as well. It takes the viewer across many countries in Latin America (Argentina, Brazil, Colombia, Ecuador, Mexico and Peru) and the USA. For example, Rodolfo Goya (Director of Neurobiology at Universidad Nacional de la Plata, Argentina) and David Ettinger (Lawyer at Cryonics Institute, USA, founded by his father Robert Ettinger, considered the “father” of cryonics) cover the issues of cryopreservation, while Hernando Ramirez Llinas (Colombia) discusses artificial intelligence and nanotechnology, including many other transhumanist ideas. Jose Luis Cordeiro is the Director of the Venezuela Node of The Millennium Project and a famous Latin American futurist following many technologies, including life extending technologies and therapies. During the main presentation organized by History Channel in Mexico City, Concepcion Olavarrieta, Director of the Mexico Node of The Millennium Project, was also present, as well as other futurists like Guillermina Baena (Executive Secretary of the Ibero-American Chapter of the World Futures Studies Federation) and Lilia Morales y Mori (World Transhumanist Association, Humanity+). Former students in Singularity University, where Jose Luis Cordeiro is also an invited professor at NASA Research Park, such as Martin Garcia also participated, together with Marcus Dantus, Director of Academia Wayra of Telefonica, and many other invited guests and journalists from the press, radio and TV. During the media tour, Jose Luis Cordeiro also showed the latest report Latin America 2030 by The Millennium Project, where four scenarios are considered during the next two decades, including one scenario where aging is defeated by rapid advances in science. The Millennium Project is a global participatory think tank that produces the annual State of the Future report, the Futures Research Methodology series, Collective Intelligence and related software, and special studies. The Millennium Project has about 50 Nodes around the world that identify participants, translate questionnaires and reports, conduct interviews, initiate and conduct special research, workshops, symposiums, and advanced training. The Millennium Project’s mission is to improve thinking about the future and make that available through a variety of media for feedback to accumulate wisdom about the future for better decisions today. 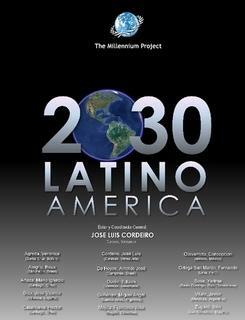 Its recent report “Latin America 2030” is also available online (http://www.millennium-project.org/millennium/LA-2030.html). History Channel currently reaches about 44 million homes in Latin America. History is the absolute leader in historic programs and also the number one producer in original documentaries from the past to the future. Its award winning programs include “The Battle of the Gods” and “Chaos” as well as famous series like “The Price of History” and “Treasure Hunters” among many others. History Channel broadcasts across the Americas in English, Spanish, and Portuguese, with original productions.